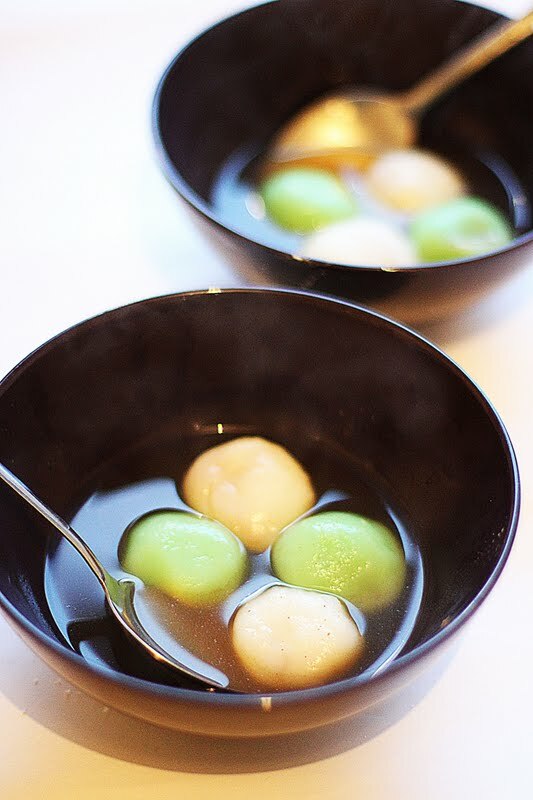 Lantern Festival or Yuan Xiao Festival is a traditional chinese festival celebrated on the fifteenth day of the first month in the lunisolar year, people eat tang yuan aka yuanxiao that day. The round shape of the balls and the bowls where they are served, come to symbolise the family togetherness. To prepare syrup, boil water in a pot. Add the screwpine pleaves and let it boil on medium fire for 5 minutes. Add sugar and ginger, let it boil for 5 minutes. Lower fire and let it simmer to another 15miuntes. Sugar can be added to taste if you like. Set aside. In a big bowl, mix glutinous flour with sugar. Add water and knead to form a paste. Continue to knead until it form a soft dough and no longer sticks to your hands. Divide into 3-4 portion and add 2-3 drops of food coloring to the each portion of dough. Divide into small balls and lightly shape into balls using both palms. Set aside a few hours or overnight as this will make the dough a bit harder and easier to handle. Boil another pot of water, drop the dumplings into the boiling water. As soon as it floats to the transfer it to the syrup water.